JNN 14 Mar 2014 Islamabad : At least ten people, including children and one woman, were killed and 31 sustained injuries in a bomb blast in front of the Science College at Jinnah Road, downtown of the Quetta, on Friday. While another Suicide blast took place in a bazaar in Peshawar on Friday leaving at least eight people dead and injuring 32 others, Press reported. Peshawar City superintendent police, speaking to the media, stated that it was a suicide attack and the target of the attack was an armoured personnel vehicle (APV). Some policemen sustained injuries but none were killed in the attack. The explosion took place in the Sarband area of the city near a petrol pump. Police, Rangers personnel and rescue teams reached the area. Bomb disposal squad was also called in and a search operation is underway. The injured were taken to a local hospital for medical assistance. According to a police official, initial investigation has revealed that the suicide jacket carried more explosives than usual – at least 14 kilograms. After the blast, firing could be heard for about an hour, possibly by the police to keep people away from the scene in case of a second explosion. The number of children who died or got injured could not be specified till the time this report was received. The Capital City Police Officer Quetta (CCPO) Abdul Razzaq Cheema confirmed that ten people were killed and 31 others wounded. “Most of the people on board a passenger bus have become the victims. Four vehicles were also destroyed in the blast,” he told The Express Tribune. Jinnah Road is located in the heart of the city and there was dense traffic when the blast occurred. The dead and the injured were lying in a pool of blood when rescue workers and police reached the spot. The blast was heard up to five kilometers from the scene of the blast. The window panes of several shops and buildings, including the Science College, were shattered due to the impact of the blast. According to the Bomb Disposal Squad, more than five kilograms of explosive material was used in the blast. “The floor shuddered with the impact of the blast and we ran amok. Near Science College, we saw people wailing and crying. They lying in a pool of blood,” said Mohammed Shahid, a passerby, adding that public and rescue workers shifted the bodies to Provincial Sandeman Hospital. A state of emergency was imposed at the hospital. “We received ten dead and more than 25 injured,” hospital sources said. 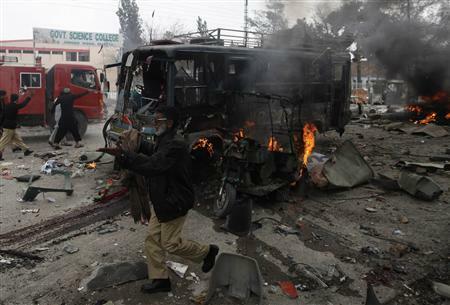 A rickshaw, a bus and two cars were destroyed in the blast. Police investigators said it is yet to be known whether the bomb was planted in the bus or fitted to a bicycle as the Bomb Disposal Squad is still collecting evidence. Another official said it seemed the target could be an FC vehicle which had passed the spot a few minutes ago. However, the same official said that there was a congregation of the Ahle Sunnat Wal Jamaat (ASWJ) in the Hockey Stadium which is situated half a kilometer from the spot. Analyst are of the view that the participants of the Congregation have taken the cover of the Situation and as all the security was focused on Providing the security to the Congregation,so the same People who are Known to have association with the Taliban and the Banned Lashkar e Jhangvi , have taken advantage of the scenario , and have Planted a Bomb In the area Near By. The Quetta CCPO said all the victims were civilians and investigations are under way. Jinnah Road is business hub of the provincial capital where offices, shopping centres, commercial establishments, restaurants and markets are located. Tehreek-e-Taliban Pakistan (TTP) spokesperson Shahidullah Shahid have disassociated themselves from the attacks and said his group will abide by the month-long ceasefire announced earlier. But the Question here arises that if we take their word , that they are not doing the Suicide Attacks and Planted attacks , then why is the PML – N Government in collaboration with the supporters of Taliban , Pakistan Tehreek e Insaaf ( PTI ) , Jamaat e Islami ( JI ) , Jamiat e Ulema e Islam – Sami Ul Haq ( JUI – S ) , Sipah e Sahaba Pakistan (SSP / ASWJ ) , have initiated a Dialogue with them , as if the Government is bound to give concessions to them in the name of Peace in the country , while the country is still under attacks , and the Innocent Pakistanis are still being Killed in By Suicide Attacks , and on the Other Hands the Armed forces are being ordered not to take any action against the perpetrators , as all the terrorist who have their Hide Outs in the North Waziristan . But the Dangerous Scenario is that the PML – N Government which is sponsored by the Saudi Government , and at the same time Sponsors of Taliban Terrorist, and Now as the Defenders of Pakistan , have started to take some action against the terrorist of North Waziristan , and have done some surgical strikes to counter the threat. So as these terrorist thought they can even be Killed , so they have begged to their Saudi Sponsors that their Lives should be spared , as they are there only to Kill Innocent Pakistanis , while No action should be taken against them either by the LEAs or the Judiciary , which is also very evident from the Past Practices of the Government , and also by the No Action Plan by the Armed forces of Pakistan . As the Government is trying to prove that these terrorist are Mightier than the Armed forces of Pakistan , and if Amnesty is not declared to these Terrorist , in the Name of Peace then they Might Kill all the Armed forces of Pakistan and Might take Over Pakistan , which is a very Treasonous thought being imposed by the Present Rulers and the supporters of these Taliban Terrorist . So as now even it is learned that the Saudi Government and the UAE Govt , has tried to Buy back the Loyalty of the Loyal Pakistani Armed Forces by Giving a Loan of around USD1.5 Billion , to make sure NO Action is taken against the Enemies of Pakistan , and the Terrorist Loyal to Saudi and UAE Governments . And the History is once again at the same Cross Roads , when in 1970 the Great Bhutto raised a Slogan “ You there , We Here ” , which was the Break Point and We have to Loose Half of the Nation . As the Taliban who Out rightly did not Honor the Constitution of Pakistan , and even the Government of Pakistan , will be given the authority to Rule , which is the same Plan , which has been Planned by CIA decades earlier , as Disintegrating Our Homeland into smaller Divisions in the name of Sects and ethnicity. So the CIA can have its Strong Foot Prints on the Ground , which can facilitate them in keeping Their Strong Presence in the Region. This entry was posted in America, Asia Pacific, Jafria, Middle East, Pakistan News, Parachanar, United States and tagged pakistan, Peshawar, Quetta, Saudi funding, Science College, suicide blasts, taliban, Terrorism, Terrorist, UAE. Bookmark the permalink. Reblogged this on Ayse Koc.